Just how dark does it have to be before our eyes stop working? 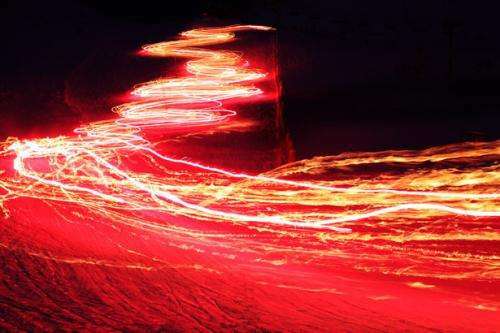 Research by a team from Rockefeller University and the Research Institute of Molecular Pathology in Austria has shown that humans can detect the presence of a single photon, the smallest measurable unit of light. Previous studies had established that human subjects acclimated to the dark were capable only of reporting flashes of five to seven photons. The work was led by Alipasha Vaziri, associate professor and head of the Laboratory of Neurotechnology and Biophysics at Rockefeller and an adjunct investigator at the Research Institute of Molecular Pathology. It is published this week in Nature Communications. "If you imagine this, it is remarkable: a photon, the smallest physical entity with quantum properties of which light consists, is interacting with a biological system consisting of billions of cells, all in a warm and wet environment," says Vaziri. "The response that the photon generates survives all the way to the level of our awareness despite the ubiquitous background noise. Any man-made detector would need to be cooled and isolated from noise to behave the same way." In addition to recording the ability of the human eye to register a single photon, the researchers found that the probability of doing so was enhanced when a second photon was flashed a few seconds earlier, as if one photon "primes" the system to register the next. Previous experiments designed to test the human eye's sensitivity have suffered from a lack of appropriate technology, Vaziri says. "It is not trivial to design states of light that contain exactly one or any other number of photons," he says. "This is because the number of photons in a classical light source such as that from a lamp or a laser follow certain statistical distributions. Although you can attenuate the light to reduce the number of photons, you typically can't determine an exact number." Vaziri's team built a light setup, often used in quantum optics and quantum information studies, called spontaneous parametric down-conversion, or SPDC, which uses a process in which a high-energy photon decays in a non-linear crystal. The process generates exactly two photons with complementary colors. In the experimental setup, one of the photons was sent to the subject's eye while the other was sent to a detector, allowing the scientists to keep track of when each photon was transmitted to the eye. To arrive at their findings, Vaziri and his collaborators combined the light source with, an unprecedented psychophysics protocol called two-alternative forced-choice (2AFC) in which subjects are repeatedly asked to choose between two time intervals, one of which contains a single photon while the other one is a blank. The gathered data from more than 30,000 trials demonstrated that humans can indeed detect a single photon incident on their eye with a probability significantly above chance. "What we want to know next is how does a biological system achieve such sensitivity? How does it achieve this in the presence of noise? Is the mechanism unique to vision or could it tell us something more general on how other systems could have evolved to detect weak signals in the presence of noise?" says Vaziri. I thought this had been known for years?? OK the method used here might be more definitive. But the counter argument, that we can only see 5 or 7 photons is hugely improbable - needing two photons would reduce the probability of a given retinal cell firing by "the law of squares" - you need 2 sparse photons to be coincident in time (within the response time of the cell) and space (hitting the same cell). Needing 7 photons all together would reduce it by "the law of seventh powers" - there is no such law, it is close to zero. Given the tiny margin just above chance, I'd conjecture that it's not that the noise ought swamp the perception of a single photon, but on the contrary, noise allows a single photon to cross the threshold for firing a detector.